Shane Watson, who debuted for Australia back in 2005, has just returned to the Australian team for the last test at Newlands, Cape Town. He scored a quick-fire 25 in the second innings but as was reported via the ABC he had to bowl at training prior to re-admission back to the team. Some of the reasoning behind the bowling test might be his batting average (which currently stands at 36.26) but a closer look at his First Chance Average might explain more. 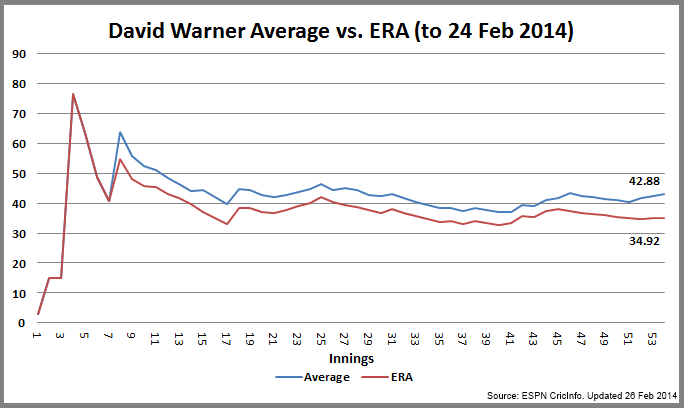 The First Chance Average (FCA) is something that I have recently developed for use in Test cricket and is loosely based off the Earned Run Average statistics utilised in baseball. The FCA is calculated using the score the batsman would have got if a legitimate chance had been taken by the opposing team. Legitimate chances include dropped catches and missed stumping’s (at this stage). Let’s look at Shane Watson’s First Chance statistics. Watson’s standard Test average is currently 36.26 after a 40 and a 25 at Newlands, South Africa) versus his FCA which sits at 27.76 (-8.49). 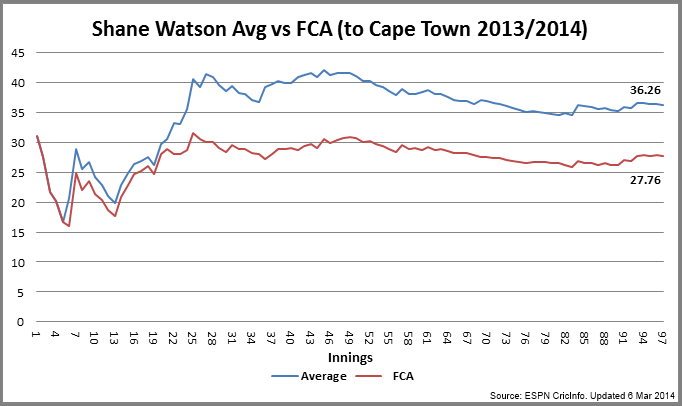 Special Note: My FCA calculation for Watson is out by up to 31-runs as he was dropped by Danish Kaneira on debut. Unfortunately the Australian Broadcasting Corporation, ESPN and Dawn.com didn’t record his score at the time just stating that he was given a chance. I even reached out to Peter English one of the ESPN commentators who were there on the day but unfortunately he couldn’t remember. 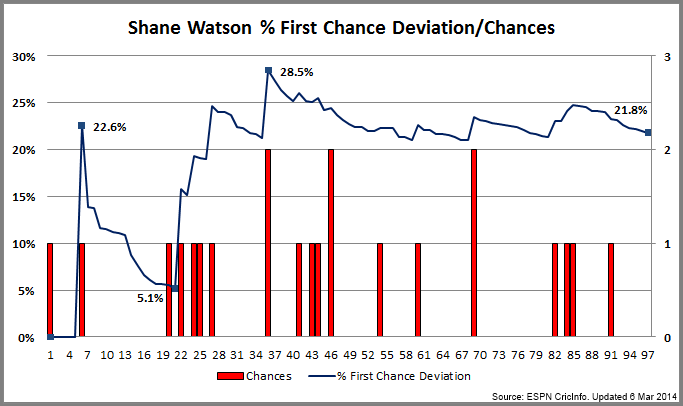 Now a look at Watson’s First Chance Deviation (FCD) and Chances. 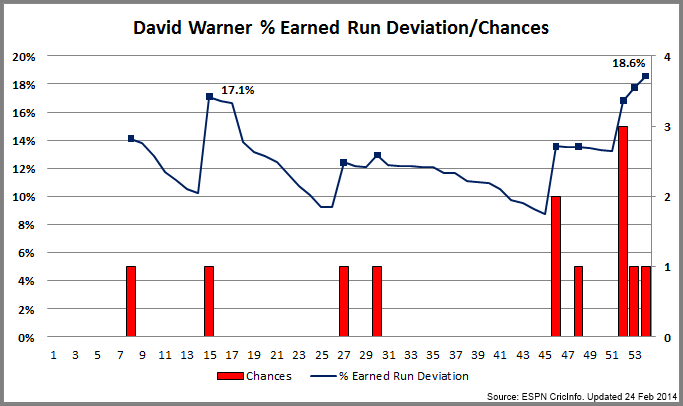 The FCD (in blue) is the percentile of First Chance Deviation runs against the total Test Runs scored by a batsman. The chances that I have been able to record are in red. Watson has had an Average Chance (AC) high of 1.0000 (one chance every innings) recorded in his first test during the Pakistan tour of Australia in 2005 and an AC low 0.1053 (one chance in almost every ten innings) recorded during the West Indies tour or Australia in 2009. Finally a look at Shane Watson’s Test batting averages. I think Shane Watson’s batting career can be summed up by his overall statistics if you consider him an all-rounder. His Test average is currently 36.26 as compared to Jacques Kallis who finished up with 55.37. If you look at his First Chance Average that reduces to just 27.76 with his first non-chance century being scored in Kennington in August 2013 almost eight years after he debuted (he was famously dropped for 99 (120*) against Pakistan in Melbourne for then dropped on 0 (126) against India in Mohali). I was surprised by the traditional batting average differential between Jacques Kallis (who I consider the best all-rounder of recent times) and Shane Watson. 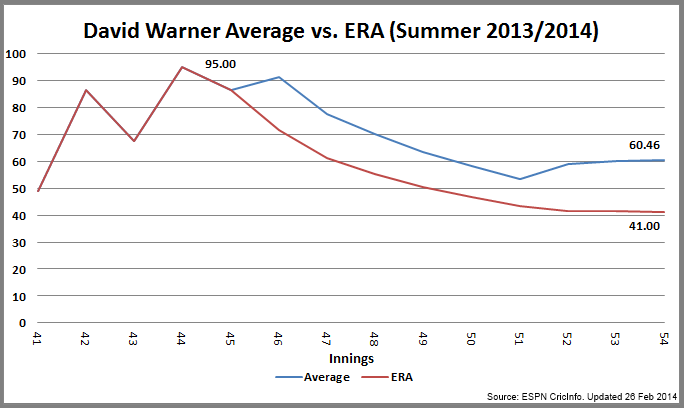 If you consider his FCA then you would have to be concerned about his Test longevity.